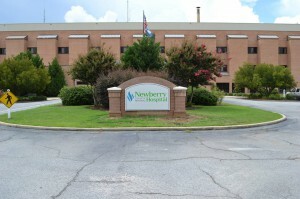 View of the entrance to Newberry County Memorial Hospital. For any our patients that require hospitalization, we offer care at Newberry County Memorial Hospital. For as long as you are at NCMH, one of our doctors will personally manage your care and see you each day as part of their daily rounds. In cases where referral or transfer are necessary, we have working relationships with specialists in all of the Columbia area hospitals. We also provide outpatient services for our patients at Newberry County Memorial Hospital such as colonoscopies, performed every Wednesday by Dr. Dixon, and Stress Sestamibi testing performed by Dr. Lovelace.